When we arrived at Chalayan’s fashion show the building was filled with the sound of busy city traffic. After everyone was seated (in the way too small chairs) smoke was blown in the air and we heard Chalayan paying a tribute to designer Alexander McQueen on his show soundtrack. 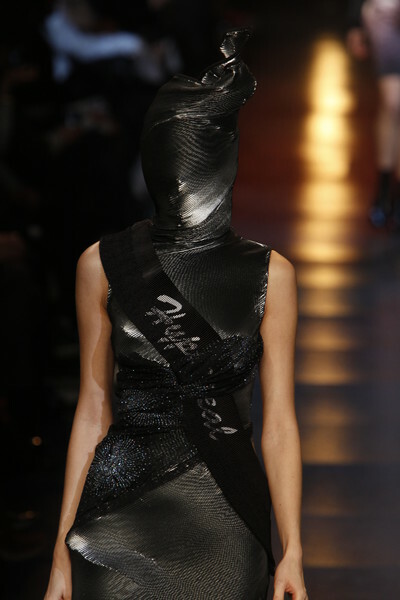 The first few models that were sent out on the runway wore some kind of fireman hats with long flaps at the back. Stiff, dark-colored coats, jeans and grey gym shoes completed their looks. Then the traffic sounds changed into the sounds of birds, a church clock and a tram and models in different styles entered the runway. They wore headpieces like straw bonnets, metal antenna’s with a feather at the end and some face-covering silver Lurex. A few pairs of glasses, which read ‘mirage’ (also the name of the show) seemed to give us some explanation on the crazy line-up. Were the diverse designs and headpieces made up in one of Chalayan’s fashion Fata Morgana’s? While the ‘music’ changed to all kinds of radio channels (we even heard Justin Timberlake’s – Rock your body) models in big ruffled jackets came on. The jackets were purple- and red-colored and had a lot of volume. 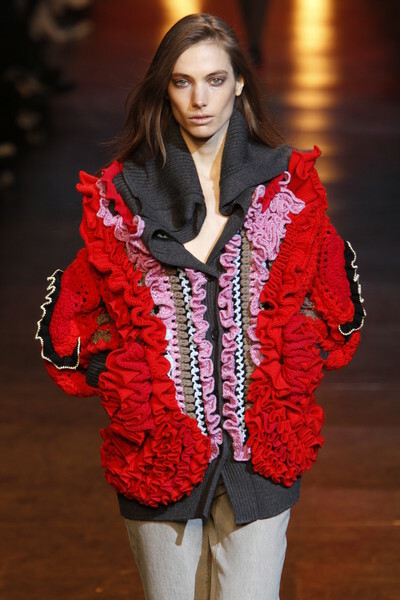 The ruffles popped up on a pair of shoes too and some models even wore red clogs. 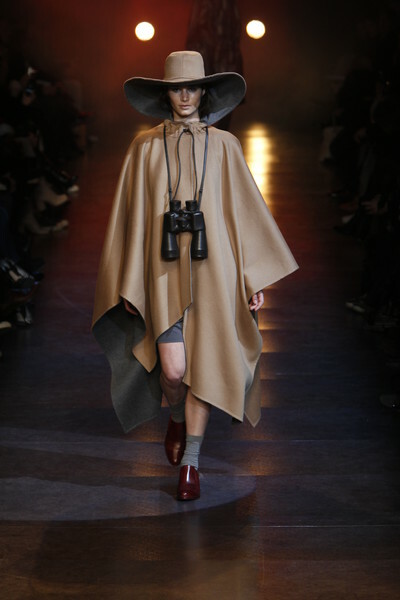 Raincoats- and hats, capes with matching binoculars and high-waisted woolen pants were part of the mirage too. They were followed by long glitter dresses, shown in black, white, purple and blue. At the end of the show several black dresses with black and pink hats came by. Altogether we thought it was one messy collection. It was only after Chalayan explained that the clothes represented different states in America (New York, Pennsylvania, Dallas, New Mexico, Utah and Las Vegas) the whole show idea became clear to us. We felt like Chalayan could have explained it all a bit better…But then again, yesterday even Jean Paul Gaultier didn’t manage to portray his different countries so well in his show.